LAS VEGAS – Cort Scheer took a venture south in order to find the pay window during his first trip to the Wrangler National Finals Rodeo. Scheer, of Elsmere, Neb., rode the Stace Smith Pro Rodeo horse Goin South for 84.5 points, good enough for fourth place in the second go-round and worth $7,344. 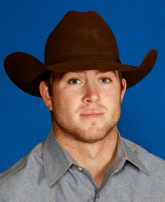 It marked a solid beginning for the young cowboy who competed on rodeo teams at Garden City (Kan.) Community College, Montana State University and Oklahoma Panhandle State University. It worked, even though there were some complications. The animal came out of the chute backwards before bucking across the arena, so the ProRodeo officials offered Scheer a re-ride. The 24-year-old cowboy decided to keep the score. “I think that’s the first re-ride I’ve ever turned down,” said Scheer, who claims the sandhills of Nebraska as home while living in the Oklahoma Panhandle community of Guymon. “But at a point, it’s got to be a business decision. Scheer earned his way to ProRodeo’s grand finale by finishing the regular season seventh in the saddle bronc riding world standings with $82,503 – in rodeo, money not only pays bills but also serves as championship points; the contestants in each event with the most money won at the conclusion of the NFR will be crowned world champions. And while the young cowboy was excited about appearing on the biggest stage of the sport, he didn’t realize the impact until opening night on Dec. 1, when more than 17,000 people crowded into the Thomas & Mack Center.